But Jesus was sinless and is eternally the Son of the Father. Even John the Baptist seems confused by what Jesus did. “John would have prevented Him, saying, ‘I need to be baptized by you, and do you come to me?’ But Jesus answered him, ‘Let it be so now; for thus it is fitting for us to fulfill all righteousness.’ Then he consented” (Matt. 3:14-15). In the context of Matthew, “righteousness” is a fulfillment of the Law. The whole significance of Jesus’ Baptism, the fact that He bears “all righteousness,” first comes to light on the Cross: The Baptism is an acceptance of death for the sins of humanity, and the voice that calls out “This is my beloved Son” over the baptismal waters is an anticipatory reference to the Resurrection” (Benedict XVI, Jesus of Nazareth, Vol. 1). 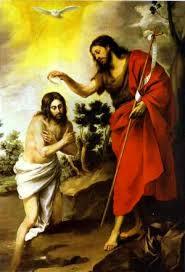 For further reading on the Baptism of Christ see Catechism of the Catholic Church (Paragraph 536).